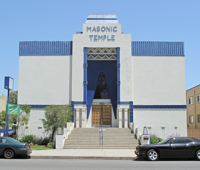 Bluejeans moguls Maurice and Paul Marciano have bought one of Los Angeles’ most notorious real estate white elephants, the Scottish Rite Masonic Temple on Wilshire Boulevard, and they have plans to turn it into a private art museum. The imposing marble-clad edifice, which has seen little use since 1994, will undergo a major renovation to house the Marcianos’ contemporary art collections. It will be operated for the most part as a private property, with occasional exhibitions open to the public. There is plenty of room to work with — nearly 90,000 square feet — in the temple conceived by artist Millard Sheets, one of Southern California’s best-known designers.